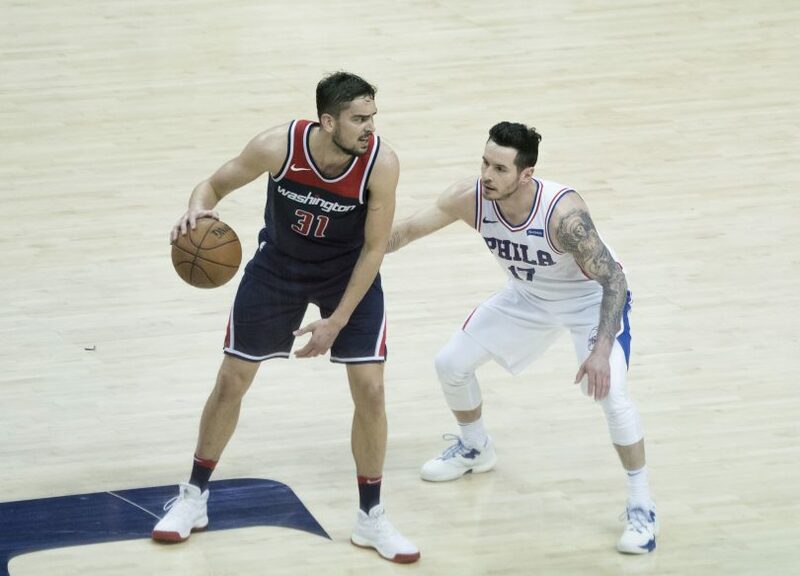 Image: “Tomas Satoransky, JJ Redick” by Keith Allison is licensed under CC BY-SA 2.0. The Philadelphia 76ers are set to face off against the Brooklyn Nets in the first round of the 2019 NBA playoffs. Although Philadelphia is coming into this years’ playoffs with high expectations, there is the possibility that injuries and a lack of chemistry may prevent this team from making a deep run— or even advancing beyond the first round. Team chemistry has been a major talking point around the Sixers all season. When the Sixers’ starting five consists of Joel Embiid, J.J. Reddick, Tobias Harris, Jimmy Butler and Ben Simmons, the 76ers outscore opponents by 24 points per 100 possessions. However, that starting five was only on the court together 10 times during the regular season. And with Joel Embiid’s lingering knee injury, it could be a little while until we see all five together again in the playoffs. That being said, the team is incredibly less potent when bench players have to come on and take starting roles. During the last 10 games of the regular season, the Sixers went 4-6 as they continuously rested and sat starters out due to injury. Philadelphia lost four of those 10 games to non-playoff teams, which certainly didn’t create any positive momentum in the locker room nor among the fan base. The fact is, without the core starting five intact, Philadelphia struggles defensively. Perimeter defense has been one of the Sixers’ biggest problems all season and they struggle to keep guys out of the paint as well when Embiid is not playing as well. This is why the Brooklyn matchup is perhaps the worst possible first round matchup for Philly (aside from, of course, playing the Celtics who always seem to have the Sixers’ number). Brooklyn has three strong perimeter players in All-Star guard D’Angelo Russell, Joe Harris and Spencer Dinwiddie. Russell has been on an absolute tear as of late, scoring at least 20 points in all but one of Brooklyn’s last 10 games. Harris has also been a scoring machine this year as he averages one of the best three point percentages in the NBA with 42.7 percent. Meanwhile, Philadelphia ranks 15 in defensive efficiency and gives up an average of 112 points per game. If it reaches a scoring shootout against Brooklyn, the Nets’ three point shooting could give them an advantage as they have already proven during the regular season. Philadelphia and Brooklyn split their four regular season matchups; however, in all four games Brooklyn scored at least 120 points. For the 76ers to beat the Nets, they will have to match the Nets’ offensive intensity through consistently scoring with Reddick and Tobias Harris. Whoever scores the most three pointers could very well be the key to this series, so that needs to be Philadelphia’s main focus on both ends of the floor. As long as Embiid is on the court covering the paint, the Sixers should be able to win the rebound game. Essentially, it comes down to limiting Brooklyn’s high percentage looks from beyond the arc and getting rebounds to limit second chance opportunities. Philadelphia has plenty of weapons who are capable of scoring and going toe-to-toe with the Nets offensively, but without Embiid’s defense and the 30 point average he has against the Nets, this could be a tough series for the Sixers. My prediction is Sixers win the series 4-2, and a majority of the games are close, high scoring contests.